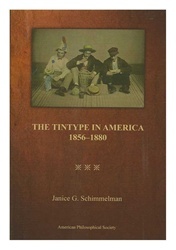 A history of the ferrotype or tintype in Amer. photography, from its origin in the 1850s until 1880. Schimmelman, Prof. of Art History, presents a history of the technological development of the tintype & its manufacture, & touches upon a number of issues relating to the cultural & social aspects of the tintype. She lays an interesting groundwork for thinking about the class dimensions of Victorian aesthetics & about the political economy of taste. The heart of the book is the extended accounts of the improvements in the presentation of the images & of the inventors & businessmen who made the improvements & advanced their careers in the business. Raises important issues in art history & the history of photography. Includes over 200 reproductions of actual tintypes.